The one thing that can't be planned for when organising a press trip is the weather. 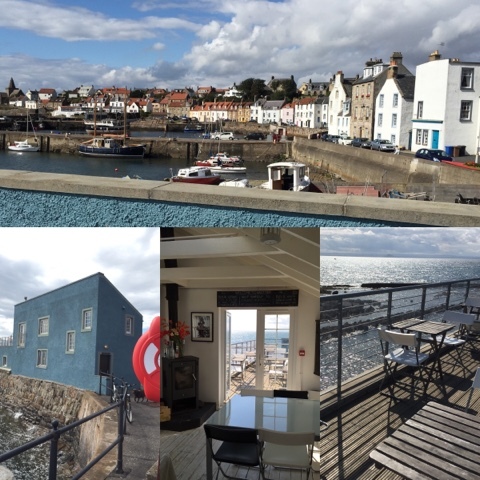 However on my recent trip to Fife as a guest of Fife Council the weather Gods were smiling and the sun shone on the East Neuk and showed its true beauty. The trip kicked off with a visit to Scotland's first Chilli farm, Chillilicious. 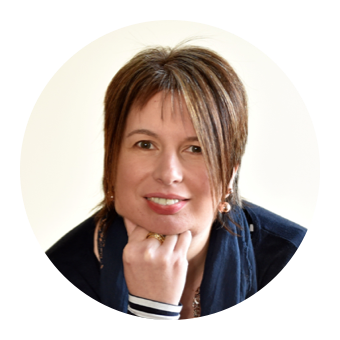 Unfortunately I was unable to attend this part of the day but Janice at Farmersgirl Kitchen has already blogged about it at Chillies & Chocolate in Fife so do catch up from her point of view. My first port of call was Pittenweem Chocolate Company. I'm much more of a savoury than a sweet tooth but when I do indulge in chocolate I'm all for quality over quantity. 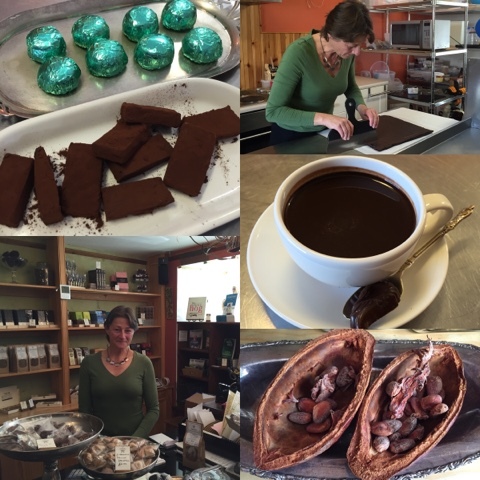 Owner Sophie Latinis welcomed us to her chocolate boutique and Cocoa Tree Cafe and led us upstairs to her working kitchen where we were offered a cup of her signature hot chocolate. It was far removed from the powdery drinking chocolate we are used to. Thick, viscous liquid chocolate with absolutely no need for cream or marshmallows on top. Think chocolate river from Charlie and the Chocolate Factory. Amazing. Although I struggled to finish the cup as it was so rich. Sophie had made up a fresh batch of Chilli Chocolate truffles for us to try and we were astonished when she said that this summer has actually been too warm for chocolate making in Scotland! We watched her expertly cut the truffles and coat them in a mixture of chocolate and chilli powder before we tried them along with one from her exclusive series of single malt liqueur chocolates. This was filled with smoky Laphroig whisky. The real deal, not a syrup. With warmed mouths from chilly and scotch we headed back downstairs for a look around the cafe and shop. There was a real continental feel to both with an abundance of chocolate memorabilia at every turn. You could have just as easily been in Paris as in Fife. 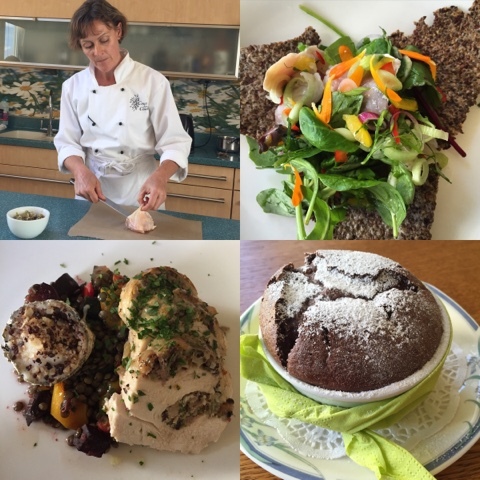 The menu boasts produce from a host of local suppliers and of course there are plenty of chocolate specialities to choose from. A few purchases in the shop and it was time to hop back on the mini bus and head to our next stop. I'd like to think that I know the East Neuk reasonably well. 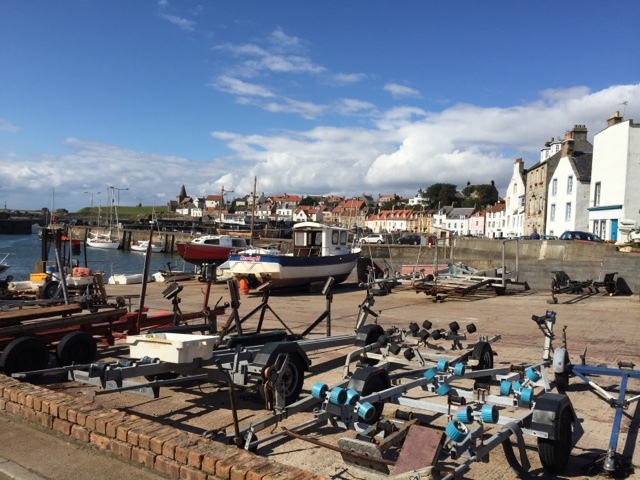 I've spent time in St Andrews and visited Crail, Anstruther, Pittenweem, and many of the other small villages around the coast. 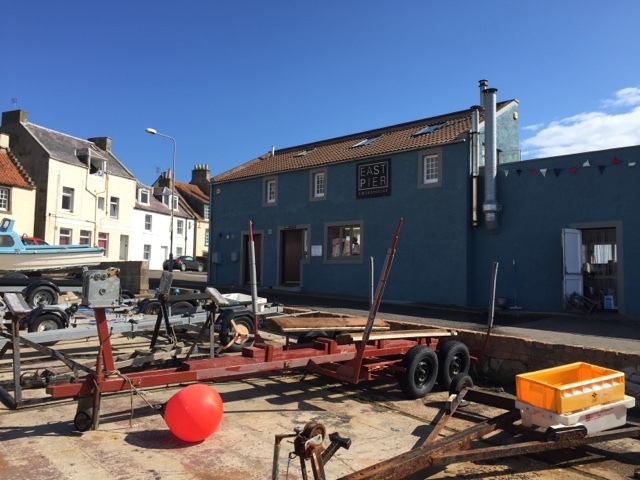 However our next stop in St Monans was uncharted territory for me and our destination of East Pier Smokehouse can only be described as a hidden gem. Of course the glorious weather helped and I got a wee bit snap happy with flowers, cottages and fishing boats all proving very Instagram worthy. 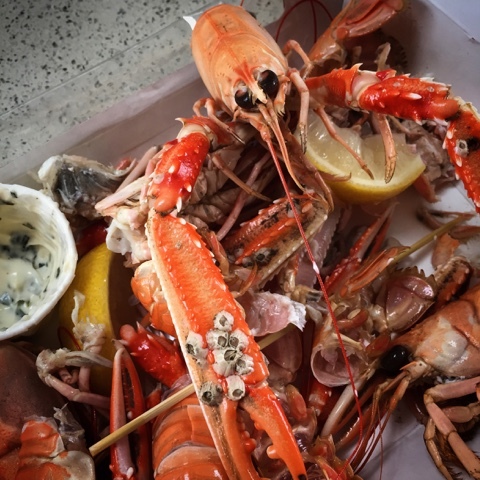 Situated in the bright blue smokehouse beside the harbour the East Pier Cafe is very informal. You order in the shop downstairs and take a seat in the gallery upstairs or on the outdoor terrace. Help yourself to cutlery, napkins, glasses and the food is delivered to you in cardboard take away boxes. We started with Smoked Langoustines, Crusty Bread and a Courgette and Goats Cheese soup. All were absolutely fantastic, however if I'd known what was still to come I would have curtailed my greed. 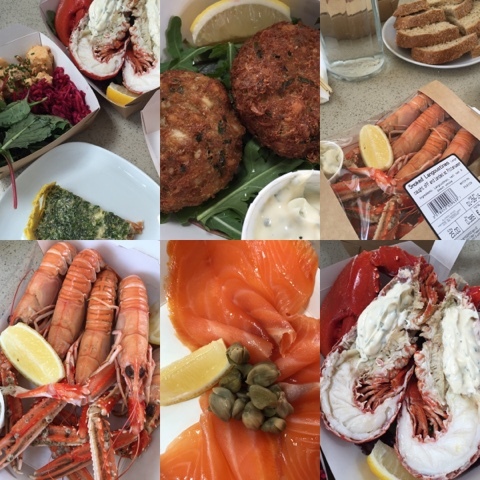 To follow was a sharing platter of crab cakes, whole lobster, quiche, smoked salmon and a selection of salads. Truly wonderful and I managed to sample them all. I even glanced enviously at other tables who had smoked brie bagels, whole smoked mackerel and amazing looking (and smelling!) chips. A return visit is most definitely on my to do list. You can't book tables during the day so make sure to arrive early for lunch, the place was heaving when we left. Over the summer they also offer evening meals for which tables can be pre-booked, alas these have now stopped for the season. 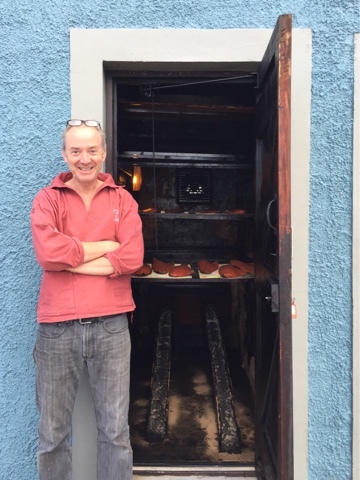 We did manage to grab a quick five minute chat with owner James Robb who showed us were the smoking magic happens behind an innocuous wee door. 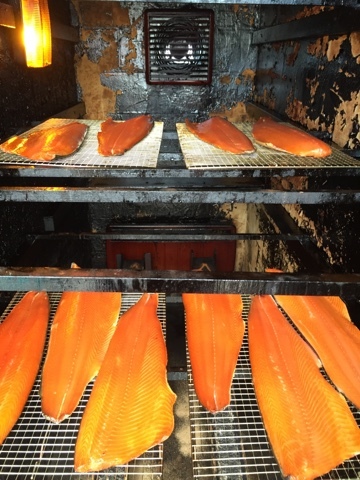 The smell inside was amazing as was the colour of the freshly cold smoked salmon in stark contrast to the blackened walls. If my favourite Scottish food is shellfish then my favourite drink has to be Gin. Our next stop was Eden Mill. 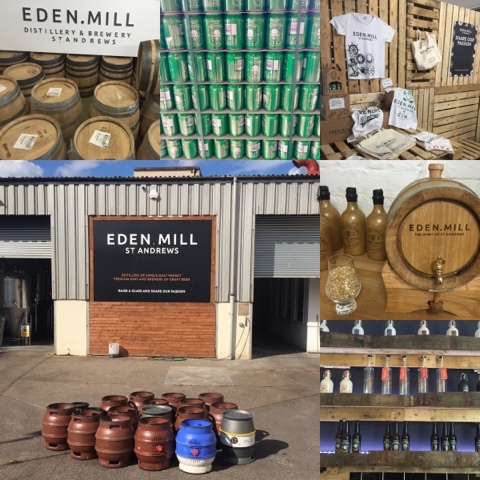 Scotland's only distillery and brewery on a single site producing beer, gin and single malt whisky. Tour guide Kathryn Baker welcomed us to Eden Mill which is located in an old paper mill at Guardbridge near St Andrews. 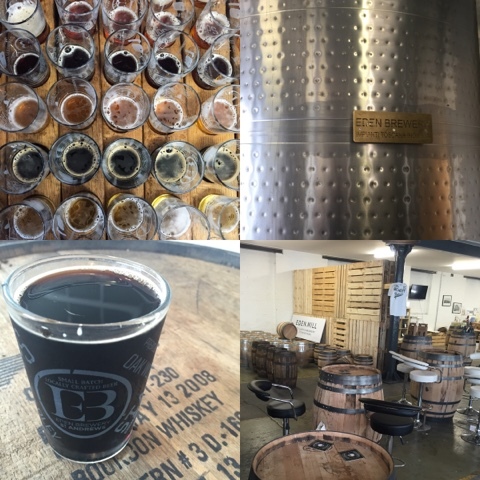 She explained the history of the site and the ethos of the brewery and distillery. In the case of Eden Mill, small is indeed beautiful. Small batch, local ingredients, real passion and big dreams. In keeping with the theme of the day we tasted a Chilli Ginger Porter. I'm more of a Blonde girl and not much of a Porter fan but Janice from Farmersgirl Kitchen couldn't get enough of it. I was more excited about what was to come next. A visit to the gin still. I've previously visited Caorunn so had an idea of what to expect of small batch gin production. 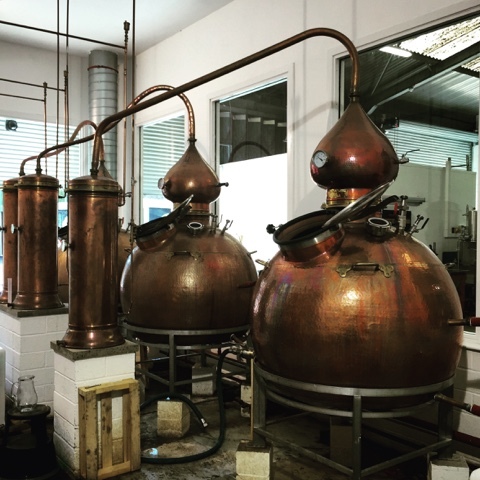 At Eden Mill the beautiful shiny copper gin still is called Curtis and the botanicals are incorporated using the vapor infusion method. There are 5 gins within the current range. Eden, Hop, Love, Oak and Golf. All come in beautiful iconic ceramic bottles which gives them great shelf appeal. Two of them already feature on my own gin shelf. No Eden Whisky to taste yet as it needs to mature for a minimum of three years. A waiting game whilst the angels take their share. 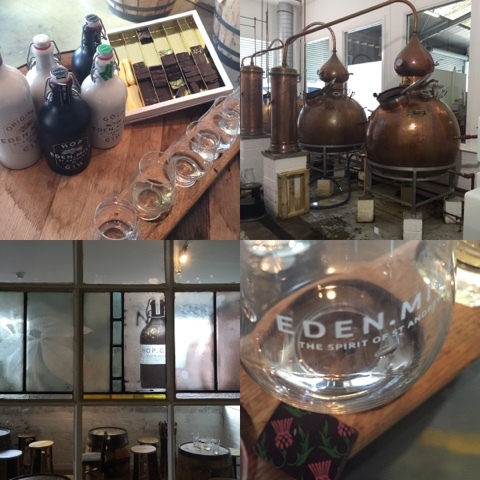 Our gin tasting encompassed a chocolate pairing with truffles from The Highland Chocolatier. Alas I was unable to take full advantage as had to drive home later in the day. My favourite combinations were the Eden matched with White Lime and Chilli Truffle and Golf with Lemongrass and Lime Velvet Praline. The visitor centre was stylish yet quirky and was very busy during our visit. 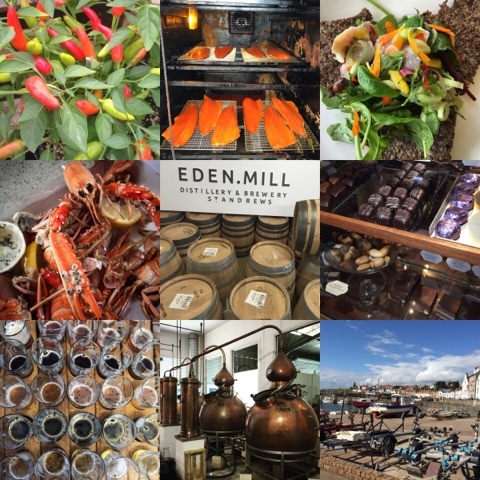 Brewery Tours and Gin Experiences are offered, best to book ahead for these. On my next visit I'll definitely be making sure I don't have to drive. Disclosure - Press Trip courtesy of Fife Council. All views expressed are my own. The weather really did help to make the day. We were joking that we could have easily been on a cruise ship when we were on the outdoor terrace at East Pier Smokehouse. Can't beat a fishing village no matter where it is in the UK. I'll definitely be back to Eden Mill sometime soon when I don't have to drive! Wow, that trip sounds incredible! Firstly, finding a chocolate boutique is now top of my bucket list! Secondly, that lunch looked like my absolute perfect meal. I'm thinking we might need to head north in the not too distant future. There's a fantastic Chocolate Food Trail Map that covers the whole of Scotland and features 78 Scottish small-scale chocolate-makers. That would keep you busy! It was such a good trip. Always wonderful to get a wee peak behind the scenes of wonderful food producers. Oh my that hot chocolate looks and sounds divine! It was so rich. As far removed from drinking chocolate as you could possibly imagine. I absolutely love that part of Fife (and the Pitteweem Chocolate Company! Been several times). Sounds like quite the delicious adventure! I'd actually been to The Pittenweem Chocolate Company previously but didn't realise until I got there. 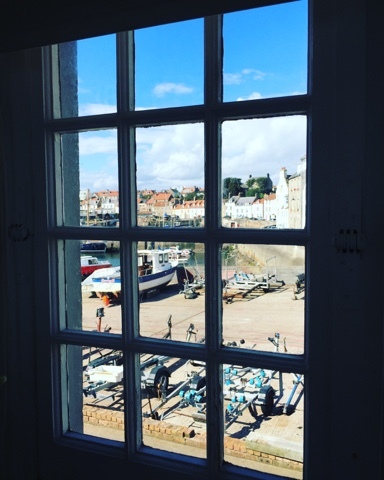 The whole of the East Neuk is just lovely. It is such a beautiful part of Scotland, plus lots of fantastic food. What's not to like? !